This was a wonderful photograph that my wife Lisa snapped the other day at a garden nursery. 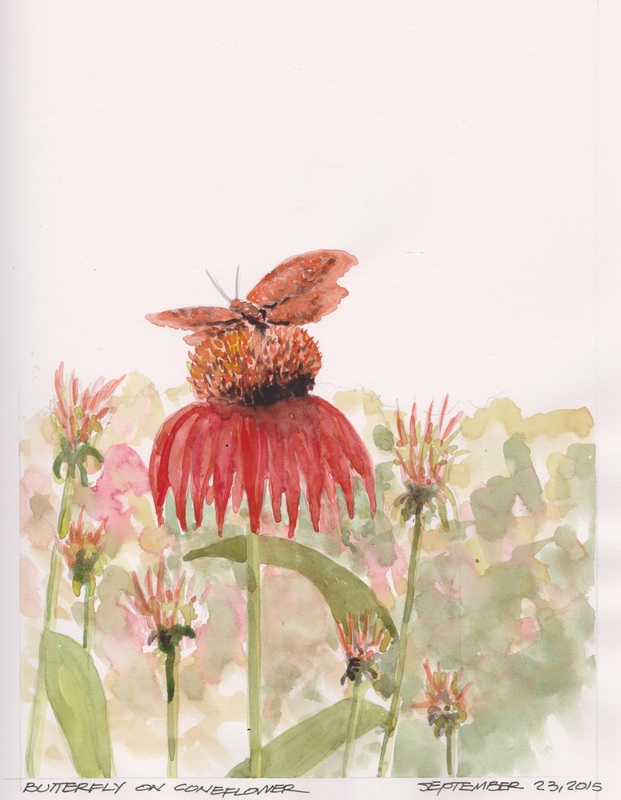 A beautiful butterfly landed on a Coneflower in full bloom. The color of the butterfly was almost identical to the interior cone of the Coneflower. The petals were a vibrant red with some purple flowers in the background. It has been a crazy busy week and I am trying to catch up with scanning and posting. Holbein and Daniel Smith watercolors in a Stillman and Birn Alpha sketchbook. I like the zoomed in effect I feel…the focus on the pretty flower and butterfly and you get less detailed the further out…..